Snacking- today, we’ll cover the good and the not so great. Sometimes snacks can be confusing; what makes something a snack? A smaller version of a meal? Something crunchy? Something hand-held? Kids are especially in need of snacks as they are always on the move and using their brain and bodies at all moments of the day. Their smaller stomachs also make it harder for them to consume large portions, making them hungry regularly throughout the day. We absolutely want to give our kids snacks, and want to ensure they are truly healthy and filling. Of the thousands of items available in the super market, many are marketed specifically as snack items (fruit snacks, snack packs of chips, lunchables snacks), but many of these options are loaded with sugar, salt, and processed grains. 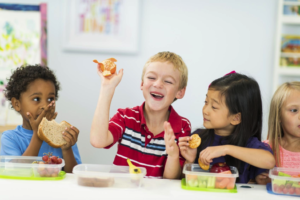 Here are a few snack items commonly eaten and a few healthier options, which will keep your kids fuller, longer. 10 grams of sugar in each ½ oz. pouch, containing about 10 bunnies. Keep in mind, ORGANIC DOES NOT MEAN HEALTHY!!! Yes, the sugar in these snacks is organic, but sugar is still sugar, no matter the type. Instead- Try some regular, sliced up fruit! Mix strawberries, grapes, blueberries, and raspberries in a small Tupperware (so they don’t get squished) for a much healthier, more filling option, packed with vitamins, minerals, and fiber. Instead- A fun trail mix. Make your own using: unsweetened raisins, dried dates, unsalted nuts (pecans, peanuts, almonds) and unsalted seeds (sunflower and pumpkin) for a fiber-rich, omega-3 filled snack. Avoid adding sweetened dried fruits, such as cranberries and blueberries. Ingredients include: Enriched unbleached flour, sugar, partially hydrogenated vegetable oil, high fructose corn syrup. 0 grams of sugar and 3 grams of fiber for every 6 crackers. Ingredients are simply whole grain wheat, soybean oil, and salt. Pair them with low sodium mozzarella cheese, a healthy chickpea, tuna, or chicken salad for a hearty, high fiber, filling snack. 4+ grams of fiber per bar and no added sugar makes these bars a wonderful, filling snack, complete with protein, fiber, and natural sugars. Most flavors are made with very simple ingredients- dates, unsalted nuts, and unsweetened fruits. We recommend avoiding the flavors made with chocolate chips and juice.